Need help? Find answers to your heating and air conditioning frequently asked questions. 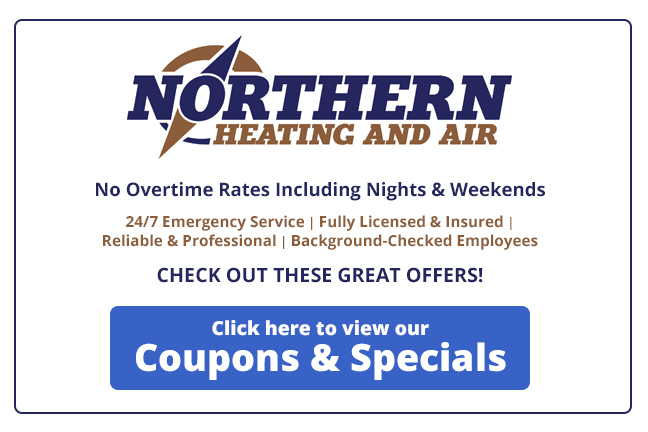 Contact Northern Heating and Air at (518) 745-0401 for furnace, air conditioning, thermostat or boiler repairs and installations in Warren, Washington, Saratoga counties! I smell gas. What should I do? In the event of a gas odor, please turn off all of your gas appliances, open windows, and vacate the residence. Once clear of the residence, use a neighbor’s phone or cell phone to notify your utility provider and the local fire department as necessary prior to calling Northern Heating and Air for service. What type of filter should I use in my furnace? At minimum, we recommend a standard pleated air filter for our customers. Indoor Air Quality solutions are our specialty, and much of that begins with a proper filter selection and application. Please feel free to ask us about our premium line of air filtration products that can help you breathe easier in your own home. Standard filters should be changed every 30 days of run time for your equipment. As an easy rule of thumb, we recommend this be done on the first of every month during heating & cooling seasons. In our climate, that equates to about 9 months per year. I hear a noise coming from my equipment. What should I do? Noises can be hard to pinpoint, especially if they are intermittent. Today’s tech gadgets can be a big help in assisting our technicians in diagnosing your system’s specific problem. If possible, record the noise you’re hearing with your cellular phone’s audio and video recording features to share with our technician upon arrival. What brand of equipment should I buy for my new heating or cooling system? Brands can be very subjective. Most people buy based on simple brand awareness. They know a name because they’ve heard of it either through word of mouth or marketed advertising. At Northern Heating and Air, we offer equipment from many different manufacturers. In the end, though, we believe that we are the brand you should trust. We want you to invest in us rather than just some manufacturer’s label and we know the most important day in the life of your new system is the day it’s installed. The best brand, if improperly installed, will never live up to expectations. Our goal is to provide you with a number of options to help you decide what is best for your home. The Annual Fuel Utilization Efficiency (AFUE) is a thermal efficiency measure of combustion equipment such as furnaces, boilers, and water heaters. In simplest terms, it is the percentage of each dollar spent in equipment running costs as related to realized output. For example, a furnace rated at 95% AFUE produces $0.95 of heat and $0.05 of lost investment for every $1.00 spent on heating costs. While AFUE is very important in energy savings, it is not the only factor to be considered when selecting equipment for any application. SEER is a measure of cooling efficiency. The letters stand for Seasonal Energy Efficiency Rating. In general, the higher the number, the more energy-efficient the equipment. However, SEER should not be the only factor when considering your cooling equipment. Are there any rebates or tax credits available to me when considering new equipment? Tax credits and rebates are oftentimes available for new qualifying equipment installed into your home. Because these incentives change quite often, we recommend you give us a call to discuss any of the current offerings. Do I really need to upgrade to high efficiency equipment? Soon enough, high efficiency equipment will be the only choice for our homes. Legislation is in process to eliminate nearly all inefficient equipment from the manufacturer’s offerings within the next few years. Some of this legislation has already been passed and implemented, and we expect this trend to continue each year for the immediate future. We can all benefit from the savings on our utility bills and further reduce stress on our valuable natural resources with the changeover to high-efficient equipment. What size unit do I need for my home? Properly sized heating and cooling equipment involves much more than a simple square foot calculation. Window size and type, insulation properties, and even the direction that your home faces can all greatly affect the appropriate size equipment for your home. That’s why we offer a free Home Comfort Survey with one of our trained Comfort Advisors. They will take the time to do a proper and accurate load calculation specific to your home. Northern Heating and Air proudly offers free in-home consultations to help you make the best choice for your needs when selecting new equipment for your home. You can also take advantage of our Home Comfort Plan Program, providing you with priority scheduling for any repair and HVAC emergency calls!